What is a sebaceous gland tumor? This tumor is a disordered and purposeless overgrowth of sebaceous gland cells. 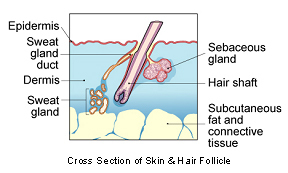 These glands are attached to the hair follicles where their function is to lubricate the hairs and skin. "Almost all sebaceous gland tumors are benign..."
Almost all sebaceous gland tumors are benign and can be permanently cured by total surgical removal. Many are multiple. Malignant tumors, which have the potential to spread to other parts of the body, are extremely rare. Cancer is often the culmination of a series of circumstances that come together for the unfortunate individual. We do not know precisely what causes these tumors but there is a genetic predisposition in some breeds of dog. Induction of cancer is a multi-step process called tumor progression. The majority of sebaceous gland tumors never progress past the first stages and are technically hyperplasias (overgrowths) rather than true, out-of-control cancers. It can be difficult to distinguish betweennodular sebaceous hyperplasia and benign sebaceous tumors (adenomas and epitheliomas) because their features overlap. These are common tumors in dogs, mainly in middle aged to older animals with a mean age of occurrence of 10 years. The tumors frequently occur at multiple sites on the same animal, but are most frequently found on the head. They are often mistaken for "warts", which have a similar appearance. There is a breed predilection that includes Cocker Spaniels. Many tumors are on the eyelids where they originate from the Meibomian sebaceous-type glands. Although these tumors are identical in type and behavior to those in other areas, they are classified as a separate group (Meibomian adenomas). The tumors are typically polyp-like (a protruding mass with a narrow base or stalk). They are frequently multiple and usually are 2-5 mm in diameter. They often itch, and if the pet scratches at them, they may become inflamed, ulcerated or secondarily infected. Clinically, tumors have a typical appearance but they can be difficult to distinguish from papillomas (warts). Accurate diagnosis relies upon microscopic examination of tissue. Cytology (the microscopic examination of aspirated cell samples) is useful for rapid or preliminary screening. Histopathology (the microscopic examination of tissue samples that have been specially prepared and stained) will give a more accurate diagnosis and prognosis (prediction of behavior). Histopathology also rules out other more serious forms of cancer. Your veterinarian will submit the samples to a specialized laboratory for examination and diagnosis by a veterinary pathologist. Although the submitted piece of tissue may be a small part of the mass (biopsy) or the whole lump, only by examining the entire lump will the pathologist be able to indicate whether the cancer has been fully removed. Treatment is surgical removal of the lump. "The body's immune system is not effective in causing this type of tumor to regress." Cancer very rarely disappears without treatment. Very occasionally, spontaneous loss of blood supply to the cancer can make it die but the dead tissue will still need surgical removal. The body's immune system is not effective in causing this type of tumor to regress. After any surgery, you need to keep the incision site clean and dry and prevent your pet from interfering with it. Report any loss of stitches or significant swelling or bleeding to your veterinarian. If you require additional advice on post-surgical care, please ask. "The histopathology report will give your veterinarian the diagnosis that helps to indicate how the tumor is likely to behave." The histopathology report will give your veterinarian the diagnosis that helps to indicate how the tumor is likely to behave. The veterinary pathologist usually adds a prognosis that describes the probability of local recurrence or metastasis (distant spread) of the tumor. Sebaceous gland hyperplasia and sebaceous gland adenoma are benign tumors. They do not recur following excision although some animals can have multiple tumors, so further tumors may develop at different sites. 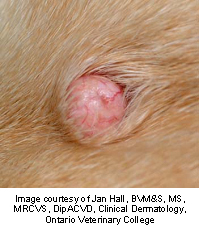 Sebaceous epitheliomas occasionally recur locally. The rare sebaceous carcinomas infiltrate the surrounding tissue but can still be cured surgically. Metastasis is very rare. No, these are not infectious and are not transmitted from pet to pet or from pets to people.